Animals eat a lot of things that might seem strange to the average person, and crocodiles are no exception. After all, the bulk of their diet consists of components such as the flesh of smaller reptiles and decaying carcasses -- not exactly appetizing to the human palate. Crocodiles also frequently swallow stones. Crocodiles and several types of birds are among the animals who swallow stones, according to the Museum of Paleontology at the University of California Berkeley. A stone that has been swallowed is called a gastrolith. The consumption of rocks is a form of geophagy. All crocodile species have this strange behavior. Crocodiles don't swallow stones out of appreciation for the taste. They do it because the stones help with basic digestion, according to the Miami Science Museum. 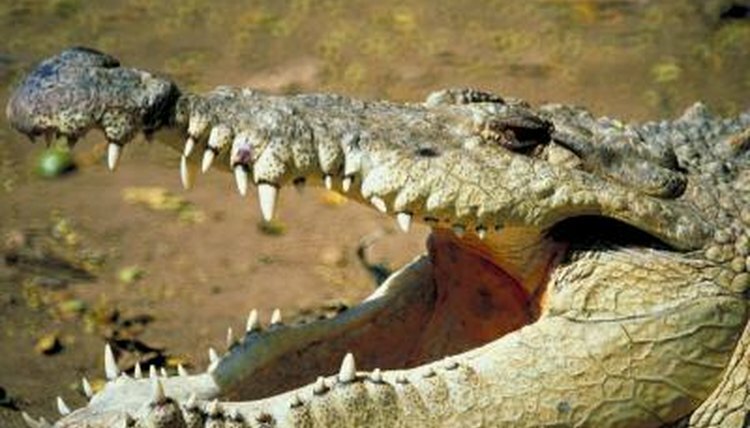 Rocks in a crocodile's stomach help crush and grate food. Rock swallowing is especially beneficial for crocodiles who eat whole prey, particularly animals with shells and tough bones. A gastrolith can remain inside the stomach for years. Apart from making the digestion process go a little bit smoother, stone swallowing also can a crocodile feel heavier and fuller, according to some scientists. That can be useful for a crocodile who's not getting enough to eat. Stone swallowing also might enhance a crocodile's swimming skills -- a definite advantage for these aquatic reptiles. Stones inside of a crocodile's belly help him stay underwater. If you ever happen to see a crocodile looking for rocks by a riverbank, you might know what he's up to. How Did the Alligator Gar Get to South Carolina? What is the Importance of an Alligator in the Food Chain?